Thursday, July 7, 2016 was the fourth day of our vacation in The Bali Island. When the three us of stay in a hotel room, in the morning when I am still asleep vaguely I heard long ringing mingled with my mother’s voice that tried to wake me up. She asked me, “What was that sound? Quite been long time they sounding? Moreover, why at the out of the room very crowded.” I opened my eyes and within seconds, I woke up and gasped. It was the fire alarm! The alarm continually shrilled. I opened the door and saw some of guests’ hotel still wearing night robe together with their children running down to the emergency stairs while carrying their bags. Incidentally, the emergency stairs was very close with our room. I immediately yelled to my husband who apparently has been in the bathroom before the alarm rang. It turns out he could not heard the alarm sound and he did not know what was going on. Instantly we were panic, especially to me. I did not wear contact lens and had no time again to take my eyeglasses that still stored in my suitcase. I could not see anything clearly where my slippers, bags, and so on. Meanwhile, my husband rushed to checking the presence of his parents who stay in the other room on the same floor. Without fully dressed and just wearing nightshirt, the three of us runs out of the room carrying a handbag containing some of important things. It was a truly unimaginable situation yet now we experienced it. Outside of the room, my husband saw a few the rests of hotel guests overrun a hotel security that was pounding on the one of the room door that not too far from us. Evidently the smoke from that room triggered the fire alarm. Although the hotel management already made a bans to not smoking in the hotel room but the guest of the room did not conform the bans. The fire did not occurs but the irresponsible action have caused many people panic. The thrilling event was end but to be honest we still had misgivings. Therefore, we decided to bring some important stuff when we went to breakfast. Usually we always put our bags and other stuff in the hotel room. Maybe because we were still tense, we were thinking that it was a good idea we are be on the alert and be ready so that if anytime there is a fire we could run out very soon. A calamity will not waiting. It is us who have to scurry no matter how and whatever the situation. The verses above are Jesus’ teaching about the end of the time and advice to keep watch for the Lord Jesus will come in the unpredictable time. However, right now I am not talking specifically talking about the second coming and the rapture. I just wanted to remind that by the same way, the same “sudden situation”, we would confront to the last second of our lives. We cannot know exactly when the time comes, where, and how. The important thing we have to know is ready or not, everyone should and certainly deal with it! In the days of Noah, God patiently waiting when Noah was preparing the ark before the flood hit (1Peter 3:20). God patiently awaits the people repent. Surely there is enough time for everyone to repent at the time, but they wasted it until they should to perish. As long the earth still there, God still gives a chance for people to get salvation. Everybody has a lifetime to repent. In the time span, the Lord speaks and expresses His great love through His church and His messengers (Prophets, apostles, preachers, friends, relatives, business mate, etc.) Also through the many events that happened in human lives. So how about us, who have received the grace of salvation? 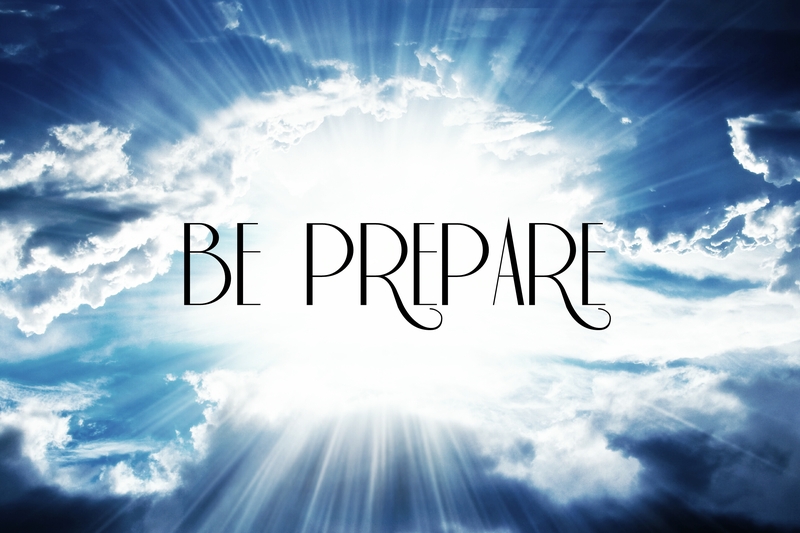 We have to prepare ourselves to meet Him face to face. We have a duty responsibility that is continue to live in repentance, being faithful servant, and become an executor of His Great Commission. The Lord Jesus has redeemed us from the old life of sin. We have moved from eternal death to eternal life. If earlier we are living under the curse of sin, now we live in grace and become a new creation in Christ. We must be consistent to continue to live in repentance and not return to our old life. We are still able to fall into sin, but we should not continue to live in sin! As David immediately repented of his mistake when rebuked by the prophet Nathan, so we must to repent every time we fall into sin. We must continue to live in holiness so that we do not squander the God’s grace. In the parable of the talents in Matthew 25:14-30 and minas in Luke 19:12-27, God gives an overview to us that He is the Lord who entrusted His property to His servants, and someday He will hold their responsibility. We will never being a faithful servant if we aren’t willing to humble ourselves because arrogant people will not be willing to be a servant. A minister manner will be born only from lowliness. To serve God doesn’t talk about activities but rather to the heart that have willingness to obey and faithful to every of His will and command. If we are faithful servant so our priority is no longer “ourselves” but God. Everything named “I am” i.e. my dignity, my behalf, my benefit, my happiness, my will, and the other “I am” must not rule over us again. We must deny ourselves so that God totally become our Lord. Thus, we can devote our whole lives to be a faithful servant who can be trusted by the Lord. Whatever the form, and regardless of the amount, the Lord has entrusted His possessions to each of us, His servant. It can be a wealth of expertise, intelligence, skill, and so forth. Our job is to manage and develop assets that already entrusted by God. If today you are a leader of a cell group with members of a few people, do the job faithfully and wholeheartedly. Make sure they grow well in your grazing. They are a treasure entrusted by God to you. If you have a marketing ability, then use it properly to bless the company where you work. Be an example to your peers. BIGGEST TREASURE God entrusted to us is the secret of the Kingdom of God that already revealed through the death and resurrection of Jesus, which GOSPEL SALVATION. We have a noble mission to preach the gospel in all the nations according to the GREAT COMMISSION. The Great Commission is not just the task of evangelists and pastors, but the duty of everyone who had been saved. If we are Disciples of Christ, we must actively move to reach others. We can do many things such as sharing tracts, testify directly, praying for the others salvation, as well as being light and witness to Christ in every area of our lives. Let us always check and recheck our hearts and lives. Do not be fooled by the religious activities that we do. Make sure that we remain on the right track while doing all our duties in faithfulness. Do not shy away from God’s presence because we cannot do anything when we apart of Him. Always maintain our relationship with God, knowing Him and understanding His will in our lives. Ask the Holy Spirit certainly help us, shape us, strengthen us, so that we later found ready to meet with our Savior, face to face.